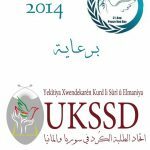 Activities of “ Peace One Day 2014 “ | Qamishlo, Syria – DOZ e. V.
2) September.18th.2014: football match between Union of Kurdish Students in Syria, “Ashti team” and “Roj team” in contest for the peace prize provided by the administration of the Union. (The game takes place in Qamishlo Stadium – Alhilaliya area – at 4 pm). 4) September.23.2014: Youth Exhibition of Fine Arts, the exhibition will continue until September 25, 2014 in the Center of the Union in Qamishlo. Show times: ( at 10:00 until 13:00 // at 17:00 pm until 19:00). The meeting will be held in the Center of the Union in Qamishlo.